I had to take a few days to sort out my thoughts on Tease. From the beginning, I hadn’t expected to like Sara. She’s one of the bullies in the novel, and feels like nothing is her fault. Honestly, I thought I’d feel a lot more anger towards Sara and her friends. Somehow, Maciel created a story and character that made me feel sorry for the bully. Not in a way that I felt like she should avoid all blame, but in a way that made me examine all her characters closely and see what made Sara different. Emma Putnam was the new girl at school. She was also the target of bullying. She killed herself and now the people who bullied her most are being charged for the harassment that led to her death. Sara doesn’t see how she is at fault when it’s Emma who killed herself. Sara and her friends didn’t kill her, but she fails to see how they were pushing her to do so. The novel jumps between the present and the past, showing the events leading up to Emma’s death and the fallout. Sara is not a likable character. She’s a little selfish and a little clueless. But she’s also a victim of high school. She wants to make the most of her years there, doing anything to be friends with the school’s “Queen Bee” Brielle. It’s an extremely toxic relationship and Maciel does a good job of showing how that friendship changes Sara. The before and after points of view also do a great job of showing how Sara is different when she’s friends with Brielle. It’s clear that Sara does a lot of the bullying to keep Brielle’s favor. It doesn’t make her bullying okay, but it gives a little context to Sara’s actions. This is not a book that anyone could pick up and read. It’s realistic, the characters aren’t very likable, and Sara doesn’t do a complete 180 transformation. She has her moments when she understands her part in Emma’s actions, but there’s a disconnect, too. Her intent through the bullying was to make Emma transfer schools. So when Emma kills herself and Sara is charged, it’s clear she can’t understand why people think she wanted Emma dead. And to be fair, reading Sara’s point of view makes it clear that she didn’t want Emma to kill herself. Sara has a lot of typical high school insecurities and getting Emma to transfer, she thinks, would fix them. Plus, by joining in on the bullying, she avoids being bullied. Tease is not a book that has a happy ending. The characters don’t redeem themselves and find complete understanding about what happened. Sara finds a way to accept her role. She knows that her actions were part of what led to Emma’s suicide, but she also finds a way to move forward with her life in a way that shows she learned something. I didn’t like her character, but I did find a respect for her at the end. I never thought I’d like a book that had unlikable characters and a plot told from the bully’s point of view, but Tease managed to do it. It doesn’t try to make you like or feel sympathetic towards the characters; that would have felt fake. 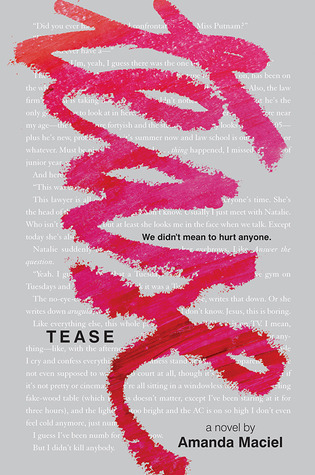 Tease is a good book that will make you consider both sides of every story. This entry was posted in Contemporary, The Must Reads, Young (and New) Adult and tagged Amanda Maciel, Contemporary, Must-Reads, Young Adult.